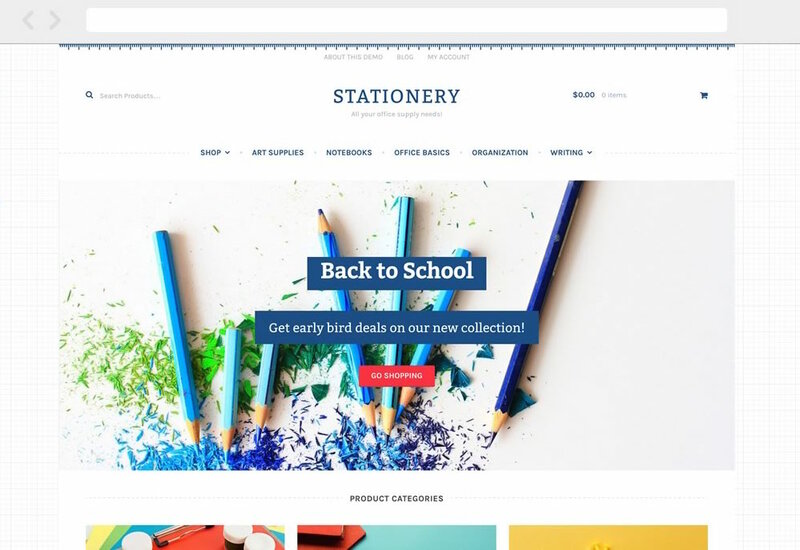 Stationery is a child theme for Storefront, the official WooCommerce theme. If offers a clean yet tactile design that is perfect for Stationery shops. Stationery is a Storefront child theme, so you first need to install and set up Storefront and then Stationery. Download Stationery from your Woo account at My Downloads. Repeat steps 3-5 for the Stationery theme from step 2. After installing your theme, a notification appears to activate your key via the WooCommerce Helper for the Stationery theme. Follow the instructions at: Adding Keys. Once installation is complete and the key is activated for Stationery, it’s time to configure and set up your themes. There are no specific image size requirements for Stationery, but image sizes used on our demo are below for reference. WooCommerce image settings are found at WooCommerce > Settings > Products > Display. It’s possible to import Woo Dummy Data to populate your site with demo products as a starting point. Note: We do not supply exact images seen on our Stationery demo in the Woo Dummy Data due to copyright restrictions. Woo Dummy Data comes with our own unique unrestricted images that can be redistributed as product import data. Stationery applies specific styles to elements such as buttons and the header layout, so these settings are removed from Storefront Designer to avoid confusion. This is powered by our Storefront Mega Menus extension. They are the five first top level (parent) categories as arranged on the product categories screen in your dashboard. You can drag and drop categories there to rearrange. Because Stationery is already a child theme, you are unable to do this. Any changes added to the Stationery functions.php file will be lost when updating. Instead, we recommended that you add code snippets to a customization plugin. We’ve created one to do just this. Download Theme Customizations for free. On the demo there’s a large dropdown on the shop menu, how can I add that?